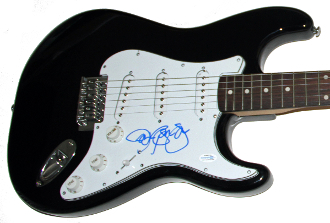 Our Products >> JON BON JOVI Autographed Signed Guitar ACOA AUTHENTIC NICE! This is an authentic Jon Bon Jovi signed strat guitar. Jon Bon Jovi signed this particular pick guard in New York City in May 2014. The signature is solid and was signed by Jon using a blue permanent felt tip. This item is Guaranteed Authentic and comes with two forms of authenticity. My (LOA) Letter of Authenticity, that states the date and place Jon Bon Jovi signed. Also, an LOA from AutographCOA, a reputable third-party party autograph authentication service. The ACOA certification number is RA60781, and can be verified under their website. If you have any questions feel free to message me, thanks! JON BON JOVI Autographed Signed Guitar ACOA AUTHENTIC NICE!